In this special illustrated edition of the #1 New York Times bestselling Thomas Jefferson: The Art of Power by Pulitzer Prize–winning author Jon Meacham, young readers will learn about the life and political philosophy of one of our Founding Fathers. Thomas Jefferson was the third president of the United States. He was one of the authors of the Declaration of Independence. But he was also a lawyer and an ambassador, an inventor and a scientist. He had a wide range of interests and hobbies, but his consuming interest was the survival and success of the United States. This book contains a note from Meacham and over 100 archival illustrations, as well as sections throughout the text about subjects such as the Boston Tea Party, the Library of Congress, and Napoléon Bonaparte. Additional materials include a time line; a family tree; a Who’s Who in Jefferson’s world; sections on Jefferson’s original writings and correspondence, “inventions,” interests, places in Jefferson’s world, finding Jefferson in the United States today, additional reading, organizations, and websites; notes; a bibliography; and an index. This adaptation, ideal for those interested in American presidents, biographies, and the founding of the American republic, is an excellent example of informational writing and reflects Meacham’s extensive research using primary source material. Ever since listening to How To Fight Presidents, I have had a little bit of a side interest in the Presidents. Thomas Jefferson: President And Philosopher by Jon Meacham presented itself to me, basically, and well, riding that whole high from How To Fight Presidents, I listened to it, way later, of course. I find Jefferson kind of interesting given that he was America’s third president and very intelligent. History is fascinating to me, and biographies of people who have made an impact on the world are especially in my wheelhouse. So, it has been like a month since I listened to this audiobook of Thomas Jefferson: President And Philosopher by Jon Meacham and I only retained a few things. One time this person met Jefferson at an inn and they had this conversation about a variety of topics. At first he thought that Jefferson was a farmer because of his knowledge of crops. Then he thought Jefferson was a lawyer because of his knowledge of law. Then he thought he was a philosopher. Then he thought he was a scientist. And no, it just turns out that he’s Thomas Jefferson, Renaissance man. I thought that was an interesting anecdote about the different hats that Jefferson has worn. Jefferson’s dad had all kinds of debts that when he died passed onto Jefferson and while yeah he seemed rich, that is not QUITE the case. Credit and all that. Jefferson and Adams died on the exact same day. How nuts is that? 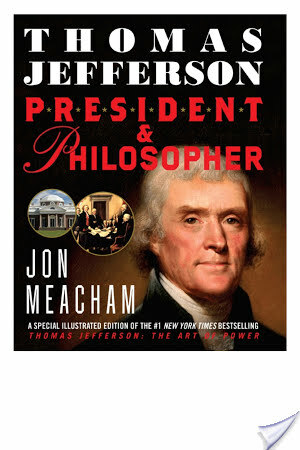 Thomas Jefferson: President And Philosopher by Jon Meacham is a quick listen. It is under 5 hours. Richard Gilmore, aka, Edward Herrmann narrated this audiobook. I like his narration but I did zone out a little. He sounds all official and serious which is a good thing given this is a serious sort of book about Thomas Jefferson. Herrmann is an appropriate narration choice. His voice reminded me of what I imagine a professor sounds like (not like any of my actual professors). Who Should Listen To This Audiobook? Yeah, this book is kind of interesting. This one’s on my list because I love presidential biographies, as well. I recently read The Bully Pulpit and River of Doubt, which took me down a Teddy Roosevelt rabbit hole that was hard to get out of!